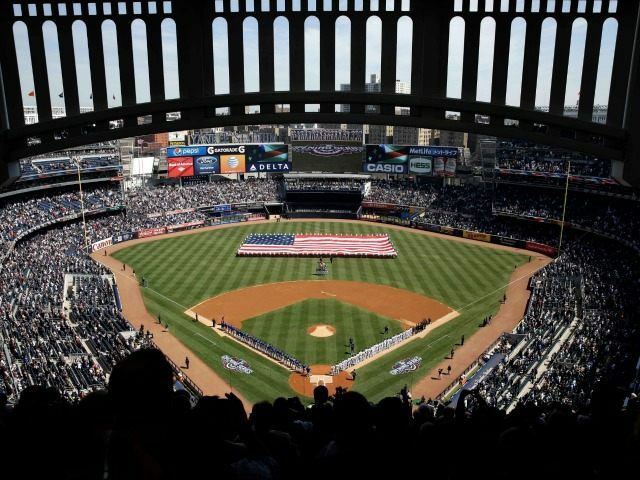 NBC’s lead baseball writer Craig Calcaterra recently caused controversy over his sudden proclamation that use of the American flag in sports is somehow “turning sports political,” despite the fact that Old Glory has filled a central role in American sports for well over 100 years. Calcaterra, who writes for NBC’s Hardball Talk baseball blog, caused quite a splash with a tweet and a post about seeing a giant American flag rolled out across the field at an Atlanta Braves game. He received so much pushback over his anti-American tweet that he wrote an entire blog post to defend his point, at the same time insisting that his original tweet was just a joke. In his post, Calcaterra insisted that an “escalation of conspicuous patriotism at the ballpark” exists, and that it started just after September 11, 2001. But even as he claims it was just a joke, the writer went on for several more paragraphs upholding his original point, as hinted in the tweet, that Old Glory is too political. So, in his attempt to climb out from under his anti-American Twitter post about the flag in sports, Calcaterra bounced from tsk, tsking and finger-pointing, to claiming he was just joking, to again lapsing into finger-pointing and excoriation to prove that he really wasn’t joking at all. Twitter users were generally not amused by the writer’s anti-patriotism position, and hundreds took to social media to slam him over his claims. Still, while Calcaterra was inundated with attacks on Twitter, he gamely replied to dozens of them, refusing to back down in the face of the onslaught. @craigcalcaterra Just curious because I honestly don’t know…Do you have same view when sports teams threaten boycott over trans bathroom bills? @craigcalcaterra You can disagree with the leaders and still support the soldiers, marines, sailors and airmen who died under that flag. @craigcalcaterra @louiswu5 @DiamondStarsGM Then what exactly is your problem with American ideals? @craigcalcaterra This is ridiculous. One can love the country and completely disagree w It’s leaders at any given point in time. @craigcalcaterra @DJFRANKSTYLES You might want to learn that our national anthem is called The Star Spangled Banner, not God Bless America. @craigcalcaterra Anyone not liking our flag needs to leave this Country!!!!! @craigcalcaterra @JohnParshon No it doesn’t, you’re the one making it political showing pride for your country & its service men. If you find that problematic you’re sad. @craigcalcaterra The entire post is Ludicrous.